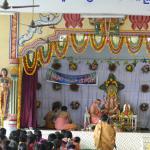 On, 8th January 2007,Monday, His Holiness Sri Ganapathi Sachichidananda Swamiji visited Datta Digambara Kshetram ,Gandigunta. 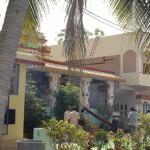 New Block of Guru Nilayam was inaugurated by Sri Swamiji. Former Minister Sri Vadde Sobhanadreeswara Rao, Industrialist Sri Velagapudi Gopala Krishna and Trustees were blessed on this occasion. HH Sri Swamiji Performed Sri Chakra Puja. 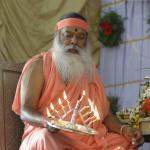 HH Sri Swamiji offered Arati to the Dattatreya (Datta Digambara avatar) and Anagha Devi idols. In His address HH Sri Swamiji has appealed devotees not to lose time over trivial matters or junk entertainment (Television soap serials) or unwanted news. Every one should have holistic approach in life and must practice meditation for at least five minutes a day, He averred. He also suggested to Matru Mandali members to conduct Bhajan training sessions and music competition for Children. HH Sri Swamiji Suggested to Gandigunta Trust committee members on upcoming projects and service events. 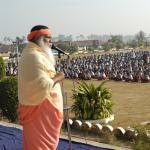 HH Sri Swamiji addresses Students at Sri Viswasanthi Educational Institutions,Vuyyuru.